If you’re a left-brained brewer, one of the most rewarding aspects of brewing is having the opportunity to truly dial-in a beer recipe. To set out with deliberate intention to brew a beer consistently, over and over and over again. To maybe make a minor recipe tweak, here or there. Manipulating the percentages of certain grains or adjuncts in the grist. Or, especially if it is a hoppy beer, layering hop combinations and perfecting the hopping rates in order to achieve the exact flavors you are setting out to create. It is, in a sense, a rather precise, scientific endeavor. On the other hand, if you’re a right-brained brewer, one of the most rewarding aspects of brewing is having the opportunity to throw caution-to-the-wind, to trust your instinct. To have only one chance a year to brew a beer, and not having any pure sense of what that will be until you brew it (and maybe not even until you package it). To be brewing, to be creating a recipe, almost on the fly. A sense of urgency to it all. This is what it’s like to brew a wet hop beer. You’re at the whim of the farmer, and it all happens within 24-hours of picking that year’s hop harvest and putting those hops into a beer. Trusting your instinct as a brewer that the beer will be good. It is a rather creative, artistic endeavor. Wet hop beers are inherently a very special thing. These beers were born in the Pacific Northwest, the heart of it all when it comes to hop-growing in the United States, at least for a long, long time. Our brewer, Patty McAnany, discovered these beers and fell in love with them during his time out in Portland, Oregon (the “second” Portland) in the Fall of 2012. As it does every year around that time in the PNW, that year’s hop harvest brought with it a bounty of wet hop ales. Brewers all throughout the region brewing beers with hops picked directly from the farm, destined for a beer that very same day. Tasting these beers was a novel experience to Patty, one informed by a sense of uncertainty as to what made these beers different, or better perhaps? Sure, the wet hops—hops that do not undergo the typical drying and pelletization before their use in a beer, but are instead freshly picked, still “wet”—impart a vegetal character to a certain degree. But the hop flavors are “muted,” rounder and softer. An extremely representative flavor of the specific hop varietal. You rub and smell a hop cone in your hand, and you taste that experience in your glass. These beers are quite particular, uniquely hopped with hops picked straight off-the-vine. Back in Portland, Noah had had some experience with wet hop beers as well, but that was limited in nature, mainly to Founders’ Harvest Ale. Geographically constrained, at least years ago at the time, this iconic wet hopped beer was one of the few that made it here to Maine. It was intriguing, a hoppy beer, for sure, but with that “x” factor that made it stand out amongst many other hoppy offerings. Yep, Patty Mc’s knowledge and affinity for wet hopped beers certainly played a role in it, but it was really the viability of The Hop Yard in Gorham, Maine that led us to try our hand at a wet hop beer. It seemed nonsensical for us to overnight hops from 3,000 miles away, and the hops grown in your “Uncle Freddie’s” (bless his well-intentioned heart) backyard garden just weren’t the type of quality ingredient that we wanted to put into a beer. There really wasn’t a legitimate source of wet hops for us (and numerous other brewers throughout Maine) until The Hop Yard came into its own, and relatively recently so. When Noah and our crew visited The Hop Yard, they were taken with the level of quality and the degree of professionalism behind the operation and the hops they were holding in his hands. Putting all of the challenges of growing hops on a commercial scale aside, these were some genuine Maine-grown varietals. Maybe “Cascade” in name and in genetic composition, but more so “Maine-grown Cascade.” Something representative of our home. Something worth it to us to use in a wet hop beer. For the second year in a row now, we’ve penciled Pine Tree Agronomics into our production schedules as a wet hopped beer to brew, and, you guessed it, at the whim of the farm, we brew it when the hops are ready. We drive out to Gorham to pick-up the hops on brewday (multiple trips are required—you can only fit so many hop flowers in a Subaru, and good luck explaining that to a cop should you happen to get pulled over! ), and then we use the mash tun as a hop back, tossing bag after bag into the hot vessel to extract all the aromas and flavors that the wet hops have to offer up. It’s quite the unique visual and olfactory experience, one that surely puts a smile on the face of even the most irritable of brewers. This year we predominantly used Maine-grown Cascade in our beer, a Pale Ale that we scaled back a bit from last year’s Pine Tree Agronomics recipe in efforts to further showcase more directly these lovely Maine-grown hops. We once again brewed the beer with all Maine-grown malts, another nod to the bounty of our home state. After fermentation in a conical tank, we transfer the beer into one of our horizontal tanks where bag-after-bag of the somewhat ironic “wet-dry-hop” addition awaits. The sheer poundage of hops is extraordinary, nearly comical. An 80-pound dry hop of pellets will quickly translate into a 400-pound-plus dry hop of wet hops, mostly a simple factor of the water-weight involved. It may be a wet mess, sure, but it’s worth it. 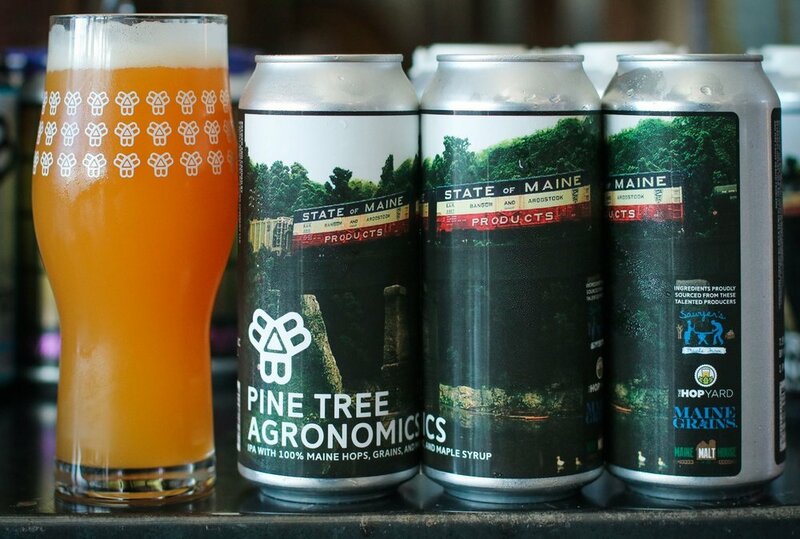 There’s a lot of uncertainty going into Pine Tree Agronomics each year, a beer we named to honor the history of logging and the lumber industry in the state of Maine. Brewed with all Maine-grown grains, and with wet hops grown just miles from the brewery in Gorham, it’s unpredictable what, exactly, the beer will taste like. We’re never quite sure what that will be until the beer goes into the package, but we damn sure know from the start that it will taste like Maine. For us, for this year’s harvest of Maine-grown Cascade and Nugget, we get a huge zippy lime presence, a Maine-centric departure on how these hops supposedly should taste on paper—a factor of how these varieties work when grown in this state specific climate and soil. And just like the fleeting window that we have to pick-up the hops and brew the beer, we recommend that this beer is best picked-up from the brewery and drank as soon as possible. Drink fresh, with good friends, in the spirit of the hop harvest in Maine.